The Frugal Family Life: "Shopping at Nichols--Tips and Secrets for Maximum Savings!" 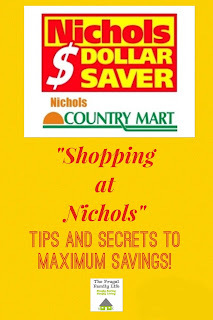 "Shopping at Nichols--Tips and Secrets for Maximum Savings!" 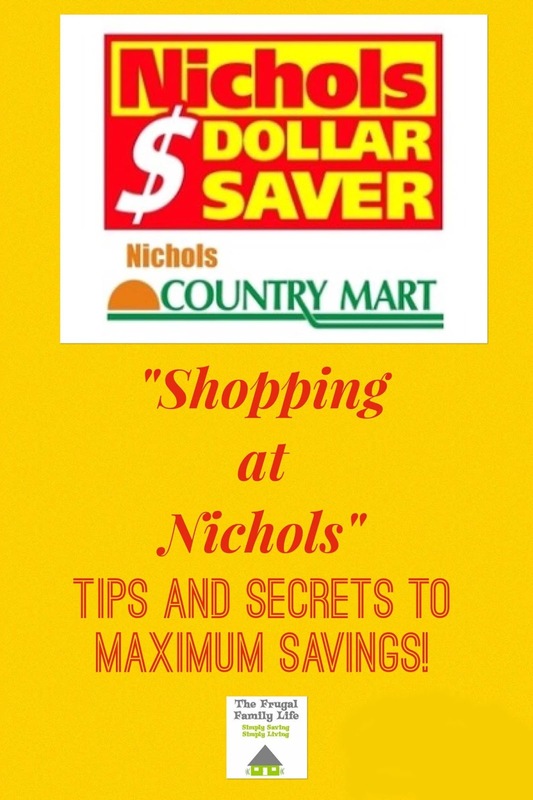 If you have followed my blog in the past, you’ll know that Nichols Dollar Saver has become one of my favorite grocery stores to shop. Several years ago when this blog was first started, I was an avid Homeland shopper. That’s where I learned to coupon and got the excitement of the “coupon bug.” After about a year and a half of living near a Homeland our family made a move to Ada, OK. At first I was disappointed—thinking my coupon shopping was coming to an end. Boy, was I wrong! Not long after moving to Ada, I discovered Nichols Dollar Saver. They accept manufacturer’s coupons, printed and newspaper…AND they double them up to $1 EVERY DAY! That means if you have a $1 coupon it becomes $2 off! That’s amazing! Not only do they double coupons every day, but they also have this wonderful thing called a price match policy. They will price match ANY local ads with the exception of Walgreens. Also, one of my other many favorite things about Nichols is double ad day. On Wednesdays, they will honor the ad from the previous week as well as the ad from the current week. That means if something was on sale last week, I can get it again! Since you can only use one like coupon at a time, this helps me be able to use multiple coupons without having to do more than one shopping trip per week. I thought since this was my favorite store to shop, that I would take a little time out of my day to give you a few tips on shopping at Nichols. Here’s my “Shopping at Nichols--Tips and Secrets for Maximum Savings!" 1. Take Your List! Each Tuesday night or Wednesday morning, I post my Nichols matchups on this blog. Make sure to check this because it shows their current ad paired up with the valid coupons. Simply print this list, or copy and paste the items you will be buying and print that. 2. Take your coupons! Double check that list mentioned above--Nichols matchups—and print any and all coupons that you plan on using. Also check the newspaper coupons you have clipped and pull the appropriate ones. In my coupon box, I have a separate envelope for Nichols. I always try to have my coupons that I’m planning on using for my shopping trip already in that envelope. That way once I get in the store, I can basically just grab the coupons out of that envelope and go grab the items. It almost works as a list in and of itself. 3. Know what you are price matching! The Dollar General, Family Dollar, Walmart, Apple Market, etc ads can be found online or most of the time in the Sunday paper. Take the time to go through and check to see if you happen to see a really good price on an item. Then check and see if you happen to have a coupon for that. I try to make this easy for you by posting a Nichols Price Match List. From that list, you can do the same as mentioned above by copying and pasting the specific items you know you want. Make sure to keep your list organized. You will need to know the store, the specific item (size, type, etc) and the price. I usually circle the item in the ad and write down on a list where I’m price matching and what the price was. Note: YOU MUST HAVE THE AD WITH YOU to price match! 4. Arrive at the store! Now that you have your shopping list, your coupons and your price match items organized it’s time to go shopping. When you arrive at the store there is a blue box at the front door that says “Buyer’s Guide.” Open that box and grab you a free buyer’s guide paper! It has all the ads in it so you don’t have to run to every store and pick up each one individually! 5. Shop! You are in the store now. You have your list, your coupons and your price match list in hand. Just pick up the items you have planned. Make sure to double or even triple check the exact items with the size, quantity, etc. indicated on the coupon. You want to make sure you are buying the exact item the coupon intended. Before going to the checkout lane make a quick glance over your shopping cart to make sure you have coupons for every single item in your cart and that you have the right quantities. Also, make sure you know which items you are price matching and put those at the top of your cart to hand to the cashier first. 6. Checkout! Once you have finished shopping head over to the cashier. Have your price match ads ready. Hand over your price match items first. This insures that they don’t accidentally get scanned and you pay full price. Watch as she/he types in the prices you tell them. You may also have to cut out the items from the ad to give them for their records. Do not cut them ahead of time. They need to see that the ad was a current ad and not cut up from previous weeks. Once all of your price match items have been entered let them scan the rest of your products. Watch to make sure they all ring up for the correct sale price. If not, speak up! Be gracious, but make sure to tell them so you will not be paying more than you are supposed to. 7. Watch the total go DOWN! Okay, you’ve watched the cashier enter and scan all your items and now you’re getting a little scared! Your total is more than expected….well, guess what! You’ve still got a handful of coupons! Hand those babies over to the cashier. Once again, watch as he/she scans each and every one of them. Make sure that it doubles—unless it’s a do not double coupon. Watch your total go down and feel that “coupon high” that I always talk about! 8. Leave the store doing a “happy dance.” Sorry, I don't have a picture of me doing that one! You are going to be thrilled that you just saved you and your family so much money! And it was even fun—kind of like a game! All right, I know, maybe it’s not quite that exciting for everyone. I am a nerd after all. A coupon nerd. But, I’m okay with that. I hope this little “Shopping at Nichols Guide” helps you start saving your family money. If you have any questions at all please feel free to ask me. Comment here on this post, or visit me on my facebook page or facebook group to discuss!